A little over 10 years ago, I picked up a zombie book called The Rising. By a first time novelist, Brian Keene. The book was quite possibly one of the best novels I had ever read. I immediately became of fan Keene and his style. In the decade since, I have read most of his works and enjoyed them all. Some more than others, but they have all been enjoyable. This past weekend at Monsteramacon here in Atlanta, I had the pleasure to meet this man who has given me so many hours of enjoyment with his novels. Meeting people you respect is always daunting, because there is a little trepidation that they will not be fan friendly. I can say that this was not the case. As soon as the con opened on Saturday we were at his table and he spent a good 20 minutes talking with us. Not only did he take the time to actually converse with us, he is a very genuine person. While being an icon of horror fiction, he also is a fan, as one would expect. He would hear us mention a book we liked and recommend a book by another author that we would most likely enjoy. It was only a few minutes before we stopped looking at him as this monolith of monsters and we were just four fans talking about the genre. Keene writes believable characters that connect with his audience. In Dark Hollow and the sequel Ghost Walk, he uses actual folklore beliefs from his native upstate Pennsylvania. So if you’ve never read any of Keene’s stuff then click on the covers below. As for my recommendations: if you love zombies then you should definitely read his Rising series, it’s one of the most original zombie concepts I’ve ever seen. Not to mention a fantastic book. My favorite books of his are Dark Hollow, Ghost Walk, and Ghoul. Truthfully, I haven’t read a book of his that I didn’t like though. If you’re a Keene fan and get the chance to meet him, you should definitely take advantage of the opportunity. 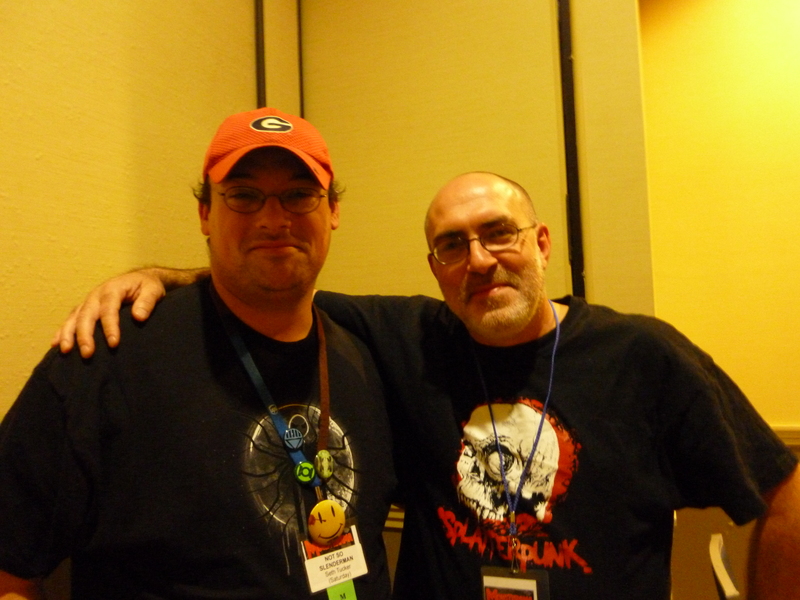 To view all his works go to Brian Keene amazon page. I even had the pleasure of getting a photo with Keene. Hello all, I know that I’ve been providing you with updates on Winston & Baum and the 7 Mummies of Sekhmet, but I thought I’d share some other items that might interest you. For those of you anxiously waiting for the next Winston & Baum adventure, you should not have much longer to wait. However, not only am I putting out a new novel this year, I also have two short stories that I anticipate releasing in the fall and winter tentatively. One of them is a vampire story that I had a lot of fun writing and I hope you’ll have a lot of fun reading. The other story and one that I anticipate debuting in winter heralds the return of my Sherlock of the supernatural: Richard Rex. That’s right, because I’ve had several people request it and because I enjoy my Victorian occult adventurer, Richard Rex will return in Richard Rex and the Graveyard of Ghouls (title may change). For those of you who have not read the first Richard Rex short, just click the picture below to go to the Amazon page. So there you have it, not only another Winston & Baum novel, but Richard Rex shall return as well. Keep checking back as I continue to give you updates regarding the release of these upcoming titles and thanks for reading.